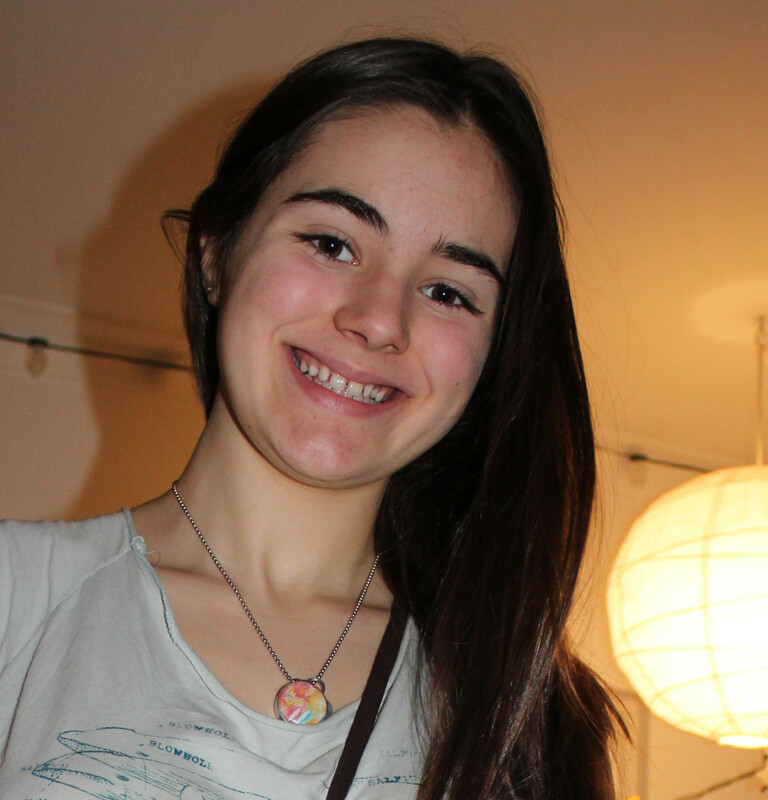 now you can WEAR MY ART! I am so excited to share this news with you! 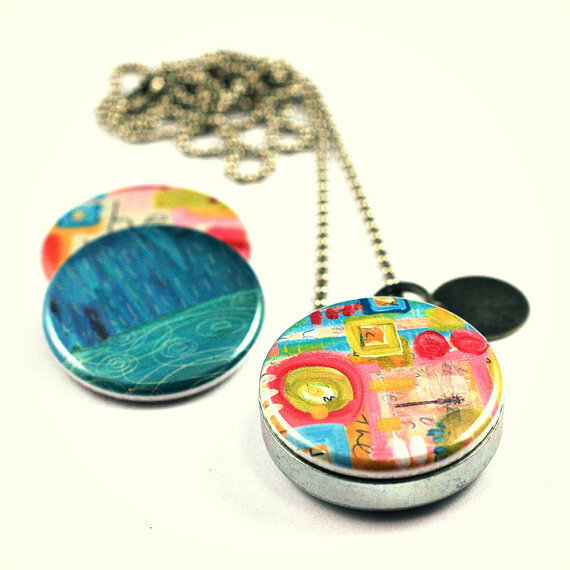 You can now WEAR MY ART on a gorgeous locket made of recycled steel! How cool is that!!? There is an amazing maker on Etsy who offers a whole range of wearable art from her Polarity shop! 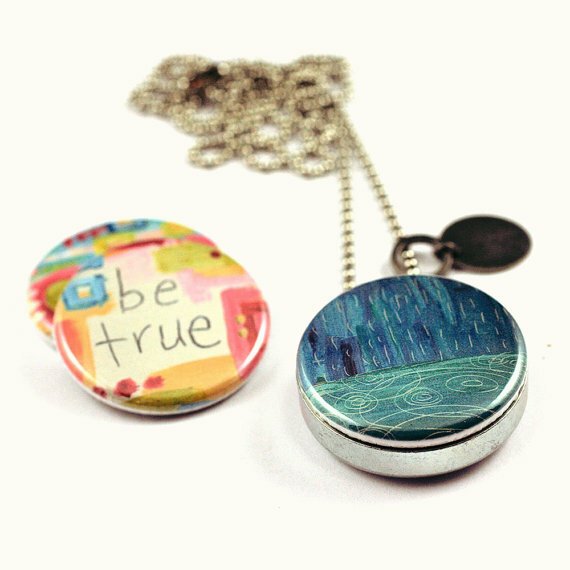 Necklaces, bracelets and rings – all made to fit interchangeable magnetic ART covered lids! 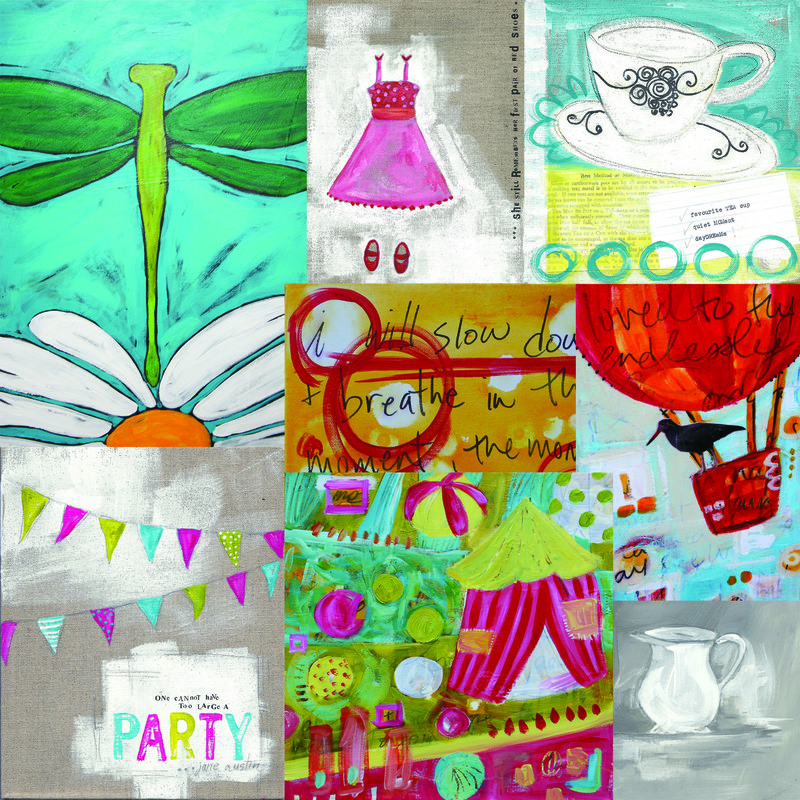 I have always wanted to order a set and was thrilled when Cat Ivins responded so positively with my request that she consider adding my art to her shop! 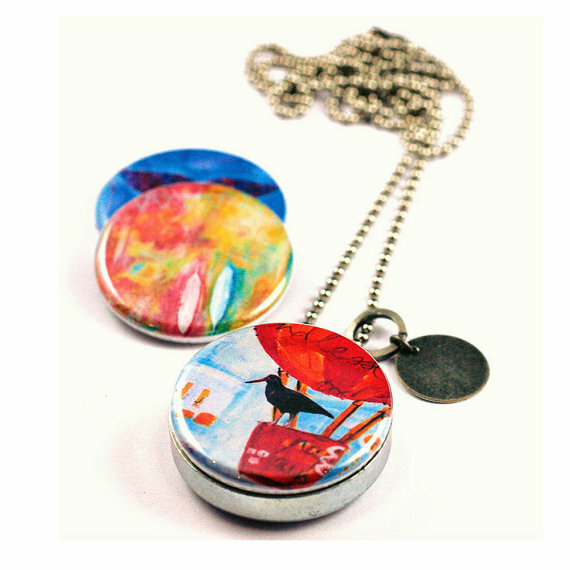 Now Polarity carries two sets of my art (each set includes 3 different lids with my art and you always get one free bonus lid…you get a custom stamped initial charm too). Of course, if you want to order them, I would request that you order through MY etsy shop! If you prefer to order a bracelet, ring or a different necklace option (check out the sweet leather options! ), please contact me for a custom listing, see more samples in the Polarity shop). 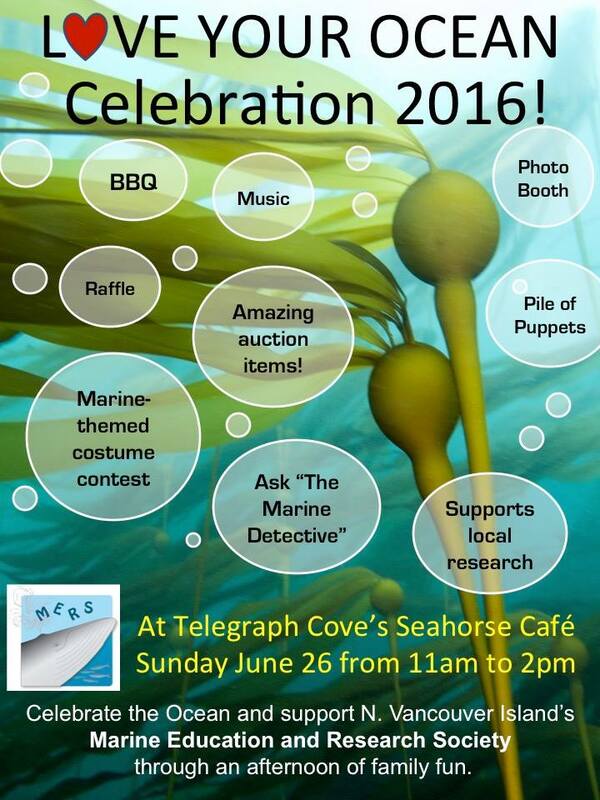 Have a look and spread the word, maybe there is someone you know (like you!) 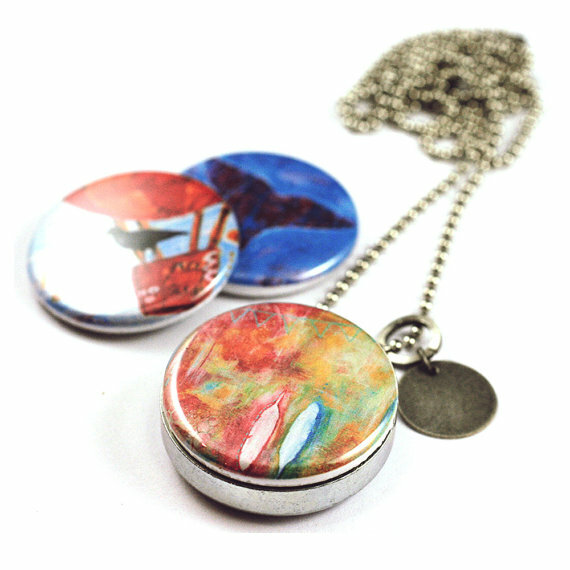 that would love to get a sweet locket set made with some of my favourite paintings! 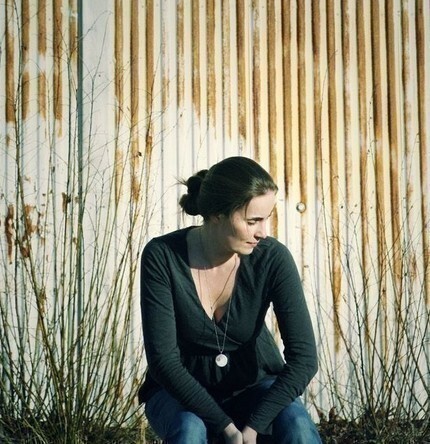 Check out the first set (words, wings and water)…. 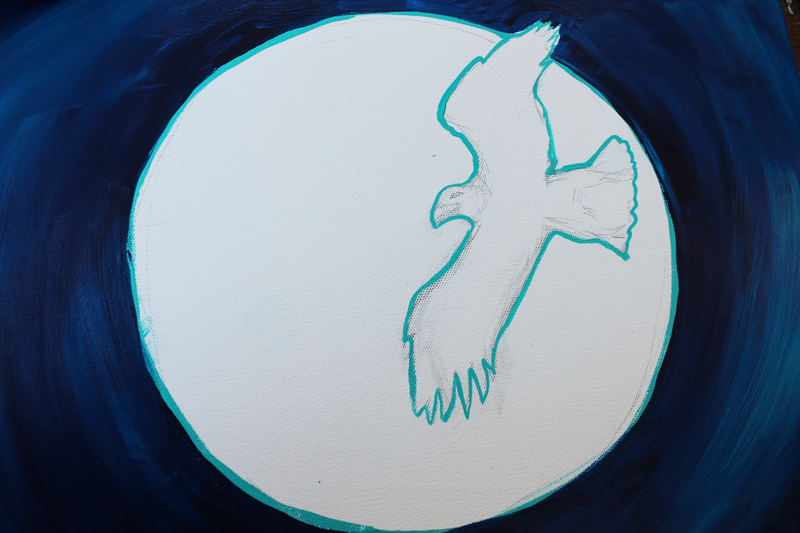 And another set (feathers, whale and oystercatcher in hot air balloon)…. P.S. 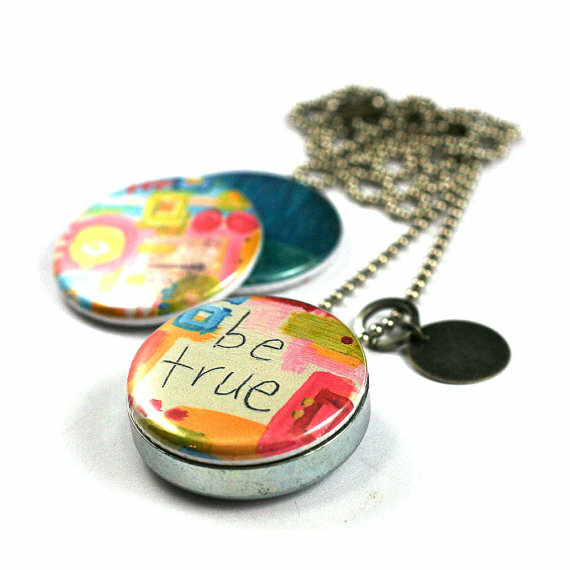 I ordered the smaller size lockets for my girls (and shorter chains, see options in my shop listings)…..they LOVE THEM!!! 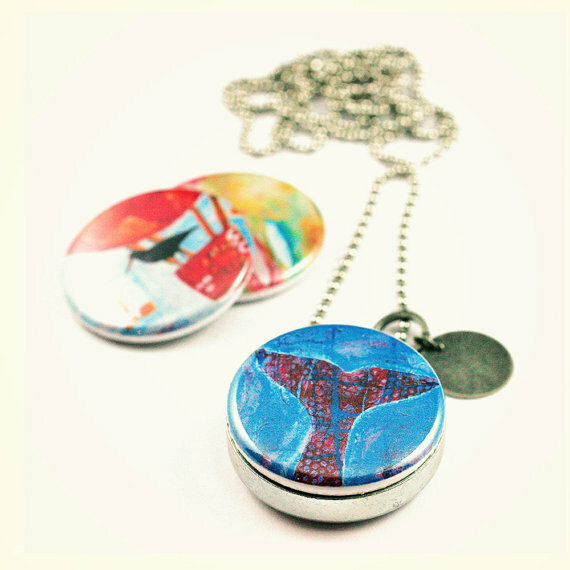 Tomorrow (for Valentine’s Day) they will be getting a few new lockets with designs by some of my favourite etsian artists (like Cori Dantini and Shira Sela…did you know Shira is from Montreal!?). Polarity really does create a whole lot of art fun for your every day! 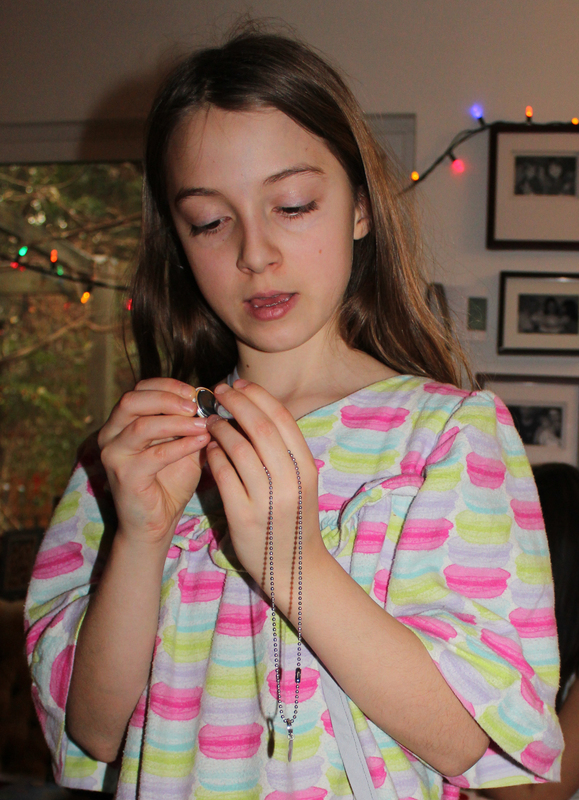 Speaking of fun, here’s a peek at some of the Christmas day joy these necklaces brought! Note: All photos (except for my girls of course) courtesy of Cat Ivins from Polarity. 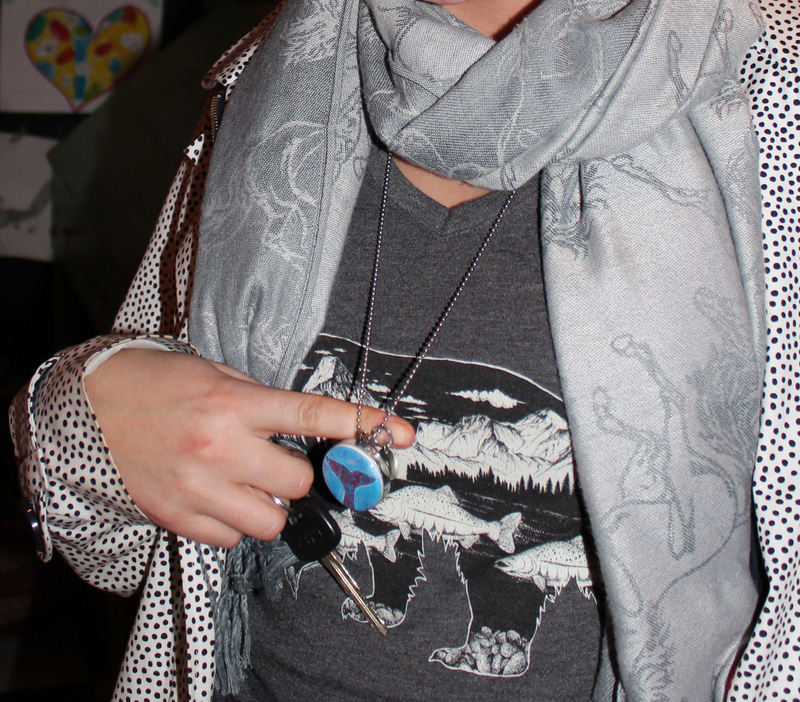 Oh, and I took this one too…doesn’t the whale tail compliment my sister’s horse scarf and bear shirt perfectly!? 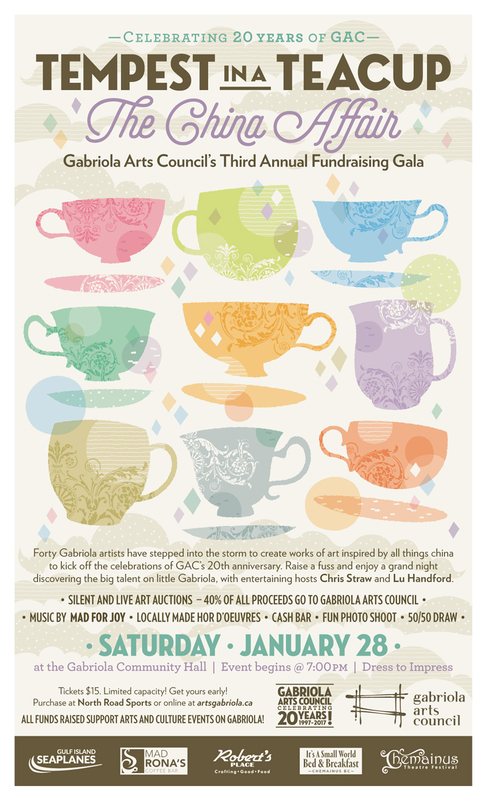 So tonight there is a local fundraiser gala event for the Gabriola Arts Council and in honour of this group’s 20th year, the theme is all about CHINA! Of course, when the call to artists went out inviting us to create something along this theme, I had to join in! 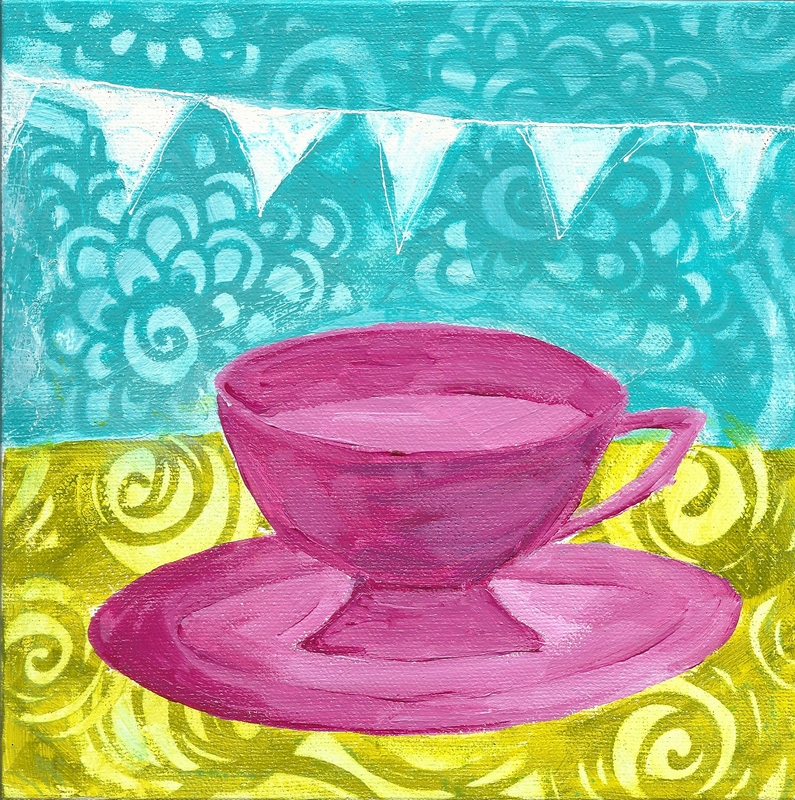 I love painting tea cups and using fancy china to drink my tea. 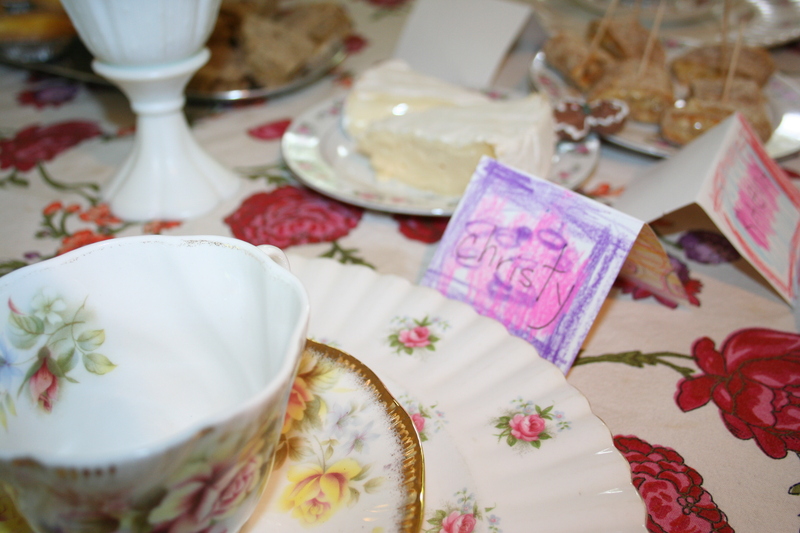 Any old day can be a tea party if you take a moment to pull out the good stuff. I started playing with ideas and really settled on this idea of using the good stuff any time, like taking it to the beach for picnics (something I love to do with my girls)! 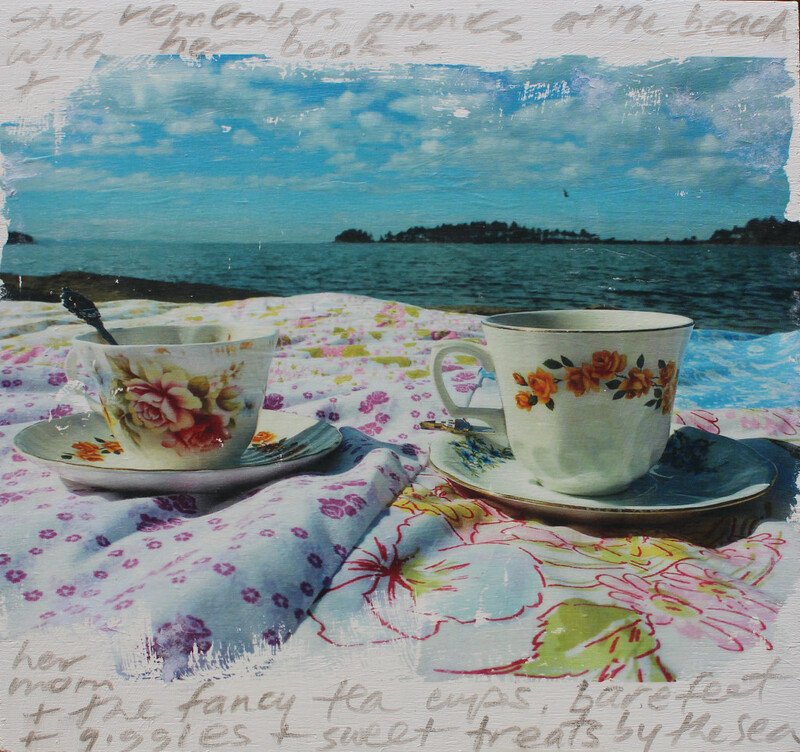 Using photos from a recent picnic with my youngest at Drumbeg, I started playing with some new photo transfer techniques and I love how well this technique works on a wood surface! You should really try it with your favourite photos! Here is the one that worked out the best, I love the feeling that comes through. ”Making Memories” is a mixed media photography piece on a 10×10 cradled panel and it will be for sale at tonight’s fundraiser event! A couple weekends ago, the amazing woman who runs ArtziStuff (the gallery in downtown Nanaimo that carries my art and cards) hosted an art party with her mom (thank you Tanya and Diane Streeter)! I was so lucky to be invited to this gathering of incredible creative women and had so much fun sharing food and stories and art supplies and techniques! 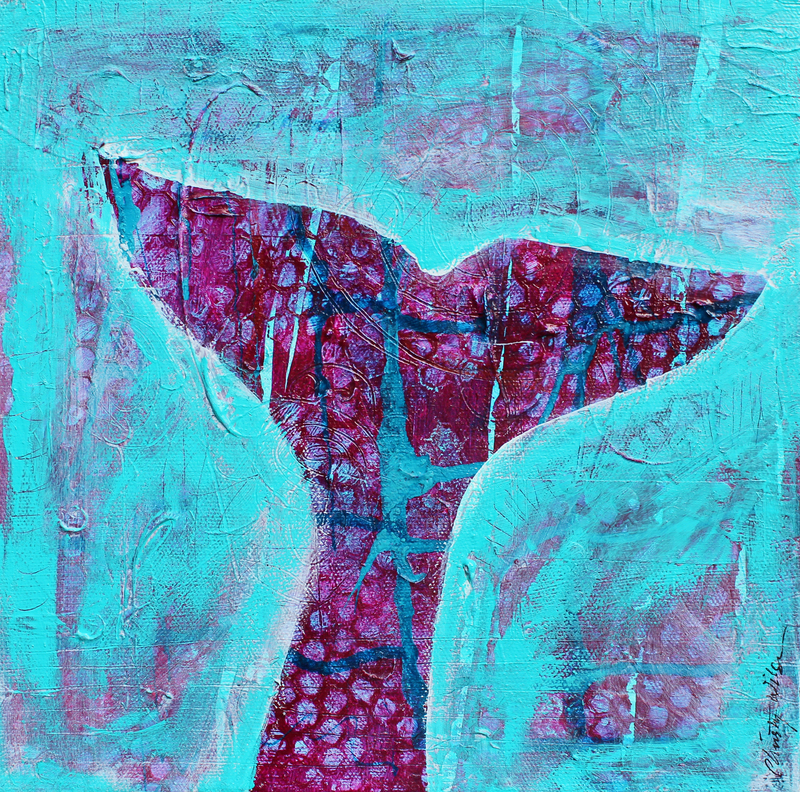 I worked (played) alongside Janice Hofman who makes amazing stencils – you can find Janice’s stuff on etsy and at Iron Oxide (an amazing art supply shop in downtown Nanaimo). She showed me some fun new stencil techniques and we had a giggle over the fact that we packed the exact same paint colours to bring for the afternoon of creating! 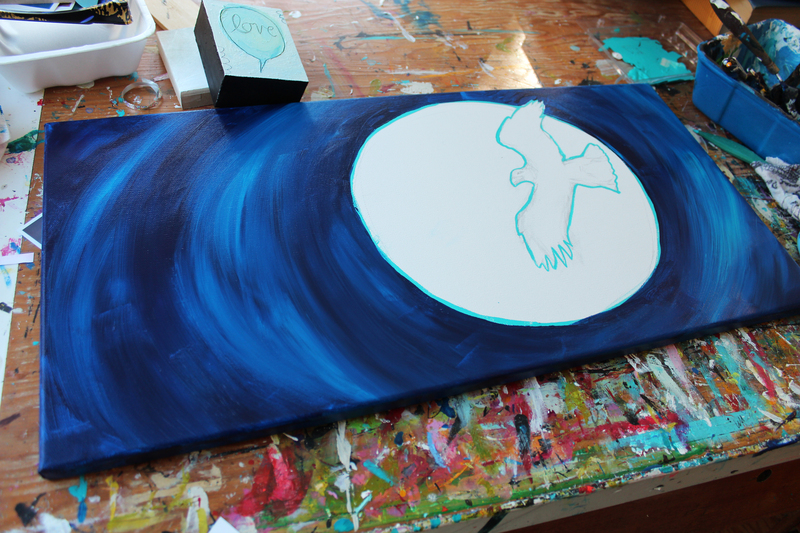 Her stencils helped me jazz up this other painting I did for tonight’s art auction…. I loved working on this sweet piece while surrounded by all my new art pals. I painted tea cups all afternoon while drinking tea (first black, then mint) and later prosecco in a fancy pink and gold tea cup. The delicious biscotti made by one of the artists at the party was just so perfectly paired with my mood (as were the stories she shared of her time in Italy). Thank you Mirella Trozzo, I must come find you again at Biscotti Di Notte in Qualicum! 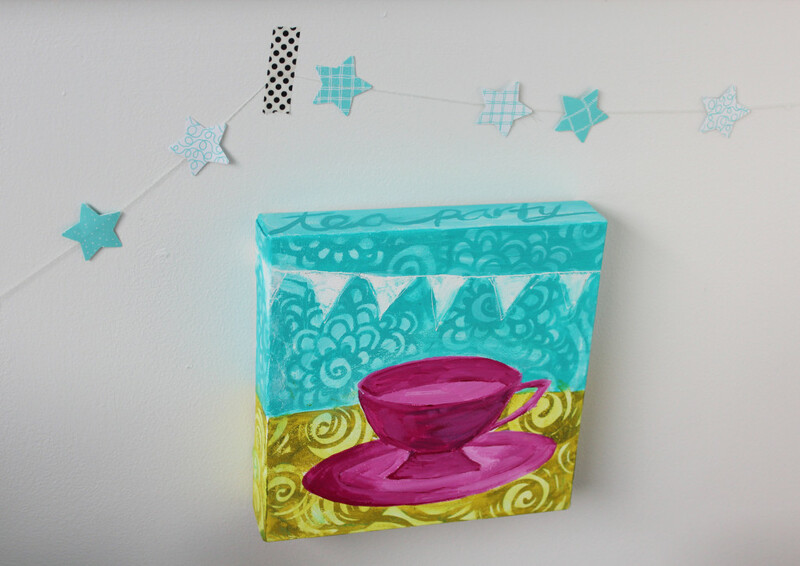 I had so much fun brewing up a collection of tea cup paintings at this little art party (and since then in my home studio). 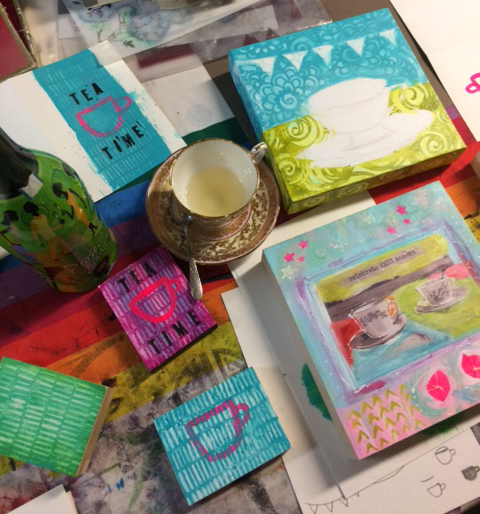 There truly has been a Tempest of Teacups in my life the last couple of weeks….with my art and with all the tea we have been drinking as my family has taken turns with the flu. Now we are all still fighting the lingering effects of the cold that came with this nasty bug and drinking more tea! I am hoping to join everyone at the Tempest in a Teacup event tonight, but I will have to see how I feel… luckily I still have all afternoon to drink healing cups of tea. 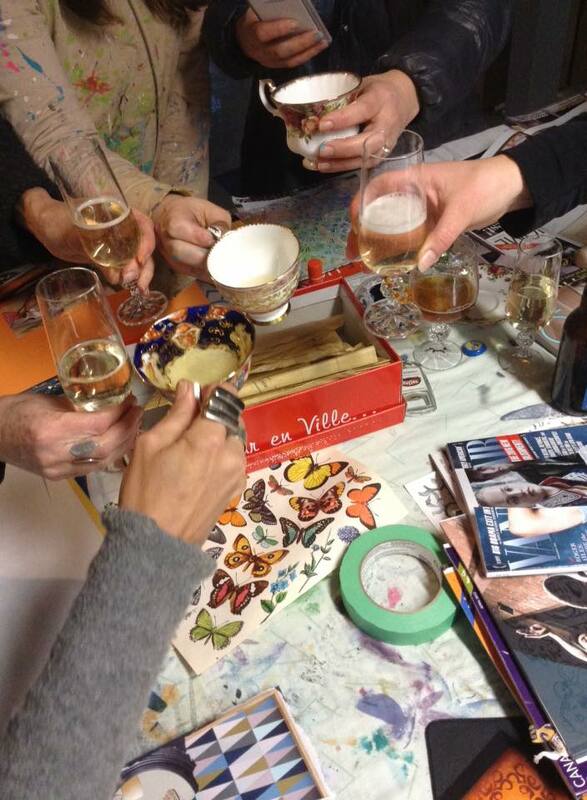 Cheers to all of you who also enjoy a good cup of tea (or prosecco)! 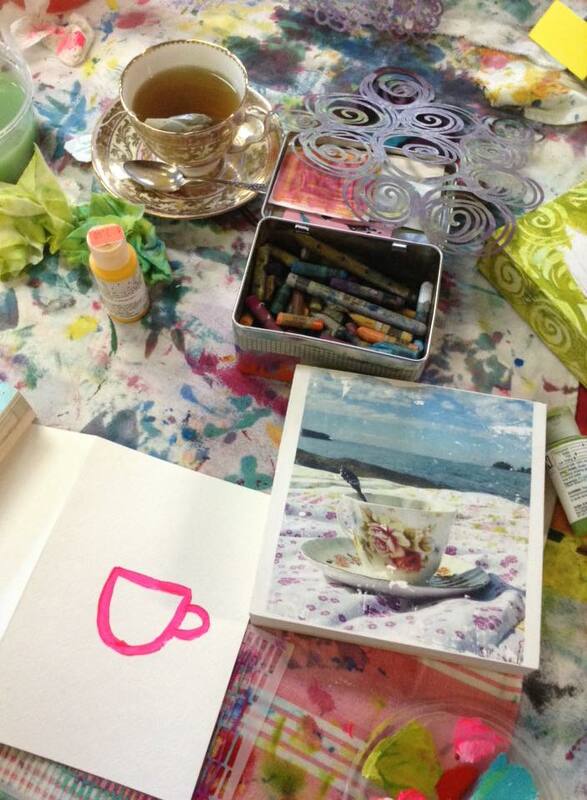 Tea parties really are perfect any time — at the beach with your kids, while creating with friends or home alone to help you heal from a cold! art party photo credits go to Mirella Trozzon and Janice Hofman – thanks for capturing the magic! Today is a day for mothers, I am missing my own mom of course, but I am also thinking of the mothers that came before….of my GRAND-mothers, one of whom is still alive….she is also a GREAT grand-mother. 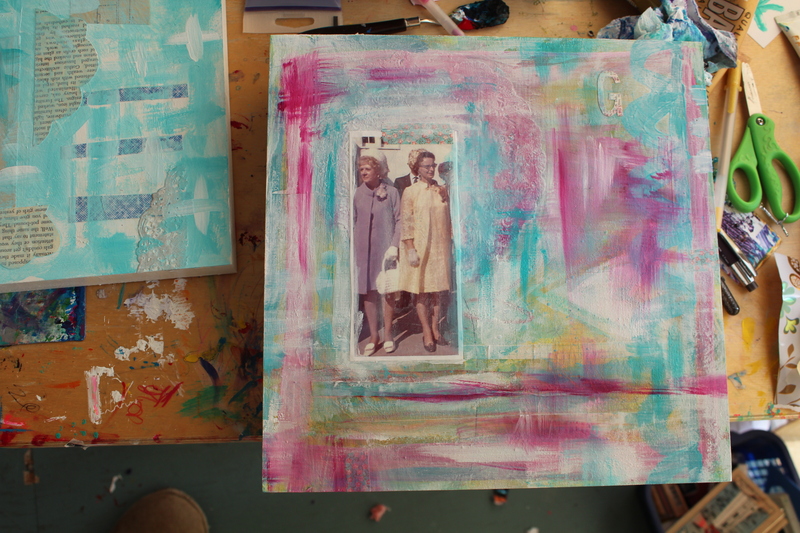 Here is a painting (in progress) of both these women, mothers that came before me, without them I would not be here today. Did they know, on this day that they donned their party hats, at the wedding of my parents, that all these years later I would be be here, another mother, with two more daughters (possible future mothers)? I’d like to think that on the day of this photo they glimpsed how their love would grow from that moment. I’d like to hold my great-grand-mother’s hand today and tell her how much her love means to me still. She is still here and yet I cannot reach her (she lives in Saskatoon, her mind is increasingly confused) but I hope that she can feel my love. I hope all the mothers that came before me can feel my love. I miss you Mom and I miss all the moms I never knew and I am grateful to them all. I also honour the mothers who have come since (step-mother, mother-in-law) and all the mothers yet to come (oh I hope my girls might feel their hearts swell with the love of their own children one day). Sometimes it is hard to look on the bright side of things, sometimes I get a bit down and start thinking about all the challenges I face and forgetting how truly great my life is! Especially when my family is going through uncertainty and change, especially when that is layered on a lack of sleep. And a moon reaching for full tends to affect my sleep in a big way! So this week there have been some hard moments…. Here’s hoping that I can keep finding this shift in perspective when I need it. Maybe the full moon can become a beacon to remind me to lighten up (rather than something that usually just gets blamed for sleep issues). It really is all about perspective….